I have written before on the Australian Broadcasting Corporation's policy of refusing to use brand names in the titles of sporting stadiums and the like. At one level, this is obviously laughable - intelligent, adult, ABC announcers are forced to use silly euphemisms like "the Scottish hamburger company" for McDonald's or generic terms like "the domestic 4-day cricket competition" when they weren't allowed to say "Pura Cup". At another level, it's unworkable. Seriously - how can you discuss modern Western life without mentioning brand names at least sometimes? Apple, Google, Windows, iPhone. Several times I've been lined up to be interviewed on-air by the ABC on aspects of consumer behaviour - once on the subject of whether consumers have too many choices - and been asked by the producer: "Oh, and please don't mention any brand names." But never was the sheer idiocy of the "no brand names" policy exposed more clearly than on ABC Local Radio this post-Christmas sporting weekend. For every AFL season since it opened, the ABC has referred to "Docklands Stadium" or just "the Docklands", refusing to acknowledge successive "commercial" names: Colonial Stadium, Telstra Dome and - commencing in 2009 - Etihad Stadium. Yet, after Supermaxi yacht "Wild Thing" raffled its naming rights, ABC Radio coverage of the Sydney-Hobart Yacht Race yesterday was happy to call the boat by the name of its sponsor... Etihad Stadium. 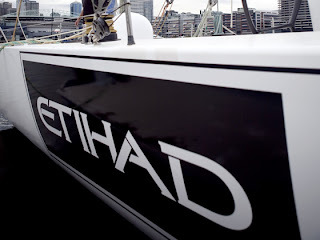 As it happens, Etihad Stadium - the sponsor - probably got more than its fair share of early media coverage on ABC Radio on Boxing Day, as Etihad Stadium - the boat - was the first high-profile retirement from the Sydney-Hobart race. So why is "Etihad Stadium" unacceptable to the ABC as the name of a stadium but perfectly OK as the name of a boat? I agree that the ABC should remain free of advertising. But saying a brand name on air isn't advertising if they didn't pay you to say it! It's time the ABC gave up this bloody-minded charade. The brand name "policy" is unworkable, hypocritical and makes absolutely no sense at all. I agree with you about inconsistency. I agree with you about the consequential hypocrisy of mentioning some brand names on the ABC and not others. I also agree that it can be a bit of a joke too. However, because you failed to explain the ABC’s own logic and wisdom of avoiding brand names before debunking them, I can only be suspicious of your point of view. I think that proper rebuttal argument requires that you recognise the benefits and the wisdom of the opposite point of view before you show us the errors of their ways. That way, dumb people like me become more fully informed by smart people like you. Even though the previous sentence may seem silly and snide, I really am a fan of yours. I thoroughly enjoy and look forward to reading much of what you have to say. I hope you consider my point of view. I find it suprising that the radio guys frequently plug twitter and similarly with facebook which are commercial entities, as they have an account with them, and like to share visuals with their radio audiences. It appears that social media isn't under the same scrutiny as every other brand or product. I wonder how they would describe twitter if they couldn't use the name... come visit our page on the 140 character site with the bird?